Historically today is the feast of St. Matilda, Queen of Germany and wife of King Henry. She was well known throughout the realm for her generosity, she taught the ignorant, comforted the sick, and visited prisoners. Betrayed by Otto after Henry’s death when he falsely accused her of financial mismanagement. Is fasting really worthwhile? Whenever I consider the value of a religious practice, I always look into the earthly life of our Savior. He is our model. He dwelt with us in order to teach us how to form our lives inwardly and outwardly. Christ Himself fasted often and accorded it high praise in His teaching. Recall how He fasted forty days before entering upon His work of teaching. At the beginning of Lent the Church wishes to stamp this fact deep in our hearts: our fasting must be in union with and in imitation of Christ's. I call to mind the mystery-laden, pregnant words spoken by our Savior when the disciples, unable to cure a possessed boy, asked, "Why could we not cast him out?," and Jesus answered, "This kind can be driven out in no way except by prayer and fasting" (Mark 9:29). This reply has always made the deepest impression on me. Prayer and fasting are extraordinary means (we may call them violent means) when other simpler ways are of no avail against the powers of hell. Now another saying of Jesus comes to mind. When John's disciples began to reproach Him, "Why do Your disciples not fast?," He replied: "Can you make the wedding guests fast as long as the bridegroom is with them? As long as they have the bridegroom with them, they cannot fast. But the days will come when the bridegroom will be taken away from them; in those days they will fast" (Luke 5:35). There is a hidden depth of meaning in these words. The coming of Christ among men was a wedding feast. Fasting had no place. But it is most proper to fast when the divine Bridegroom is taken away. Fasting on Fridays and during Holy Week, then, is in accord with Christ's own wishes. I should like to cite one further passage from the Gospel, one which casts light on fasting from another direction. 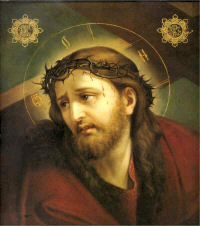 Once our Savior compared Himself with the Baptist in these words, "John came neither eating nor drinking, and they say, ‘He has a devil!’ The Son of Man came eating and drinking, and they say, ‘Behold a glutton and a wine drinker.’" John was a man devoted to penance, an ascetic, who fasted throughout his life. Not so Christ. His way of living was not based exclusively upon self-denial and mortification, but upon an ordered enjoyment of life. So we learn from the Savior that fasting should be the exception, not the rule, in Christian morality. To complete the lesson let us consider for a moment the passage in the Sermon on the Mount where Jesus speaks of the three important pious exercises of fasting, prayer, and almsgiving. He highly recommends all three, but warns against practicing these virtues in a pharisaical manner. Fasting is an extremely important means of resisting the inroads of hell (hence Lent). Fasting should be practiced as a memorial of Christ's death (Friday, Holy Week). Fast days occur by way of exception in Christian life, they are not the normal practice. Fasting holds a place alongside prayer and almsgiving as a pious exercise. This princess was daughter of Theodoric, a powerful Saxon count. Her parents placed her very young in the monastery of Erford, of which her grandmother Maud was then abbess. Our Saint remained in that house, an accomplished model of all virtues, till her parents married her to Henry, son of Otho, Duke of Saxony, in 913, who was afterwards chosen king of Germany. He was s pious and victorious prince, and very tender of his subjects. Whilst by his arms he checked the insolence of the Hungarians and Danes, and enlarged his dominions by adding to them Bavaria, Maud gained domestic victories over her spiritual enemies more worthy of a Christian and far greater in the eyes of Heaven. She nourished the precious seeds of devotion and humility in her heart by assiduous prayer and meditation. It was her delight to visit, comfort, and exhort the sick and the afflicted; to serve and instruct the poor, and to afford her charitable succor to prisoners. Her husband, edified by her example, concurred with her in every pious undertaking which she projected. After twenty-three years' marriage God was pleased to call the king to himself, in 936. Maud, during his sickness, went to the church to pour forth her soul in prayer for him at the foot of the altar. As soon as she understood, by the tears and cries of the people, that he had expired, she called for a priest that was fasting to offer the holy sacrifice for his soul. She had three sons: Otho, afterwards emperor; Henry, Duke of Bavaria; and St. Brunn, Archbishop of Cologne. Otho was crowned king of Germany in 937, and emperor at Rome in 962, after his victories over the Bohemians and Lombards. The two oldest sons conspired to strip Maud of her dowry, on the unjust pretence that she had squandered the revenues of the state on the poor. The unnatural princes at length repented of their injustice, and restored to her all that had been taken from her. She then became more liberal in her alms than ever, and founded many churches, with five monasteries. In her last sickness she made her confession to her grandson William, the Archbishop of Mentz, who yet died twelve days before her, on his road home. She again made a public confession before the priests and monks of the place, received a second time the last sacraments, and, lying on a sack-cloth, with ashes on her head, died on the 14th of March in 968. 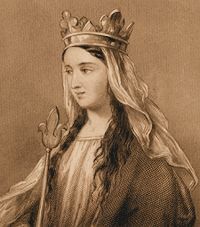 Learn more about St. Matilda here. The church stands on the site of St. Lawrence's martyrdom. The appellation refers to the name of the street, which in turn most likely refers to the tradition of the Poor Clares in the adjacent convent of distributing bread and ham (pane e perna) on August 10th, the feast day of St. Lawrence. This is done in remembrance of St. Lawrence distributing funds from the church to the poor.